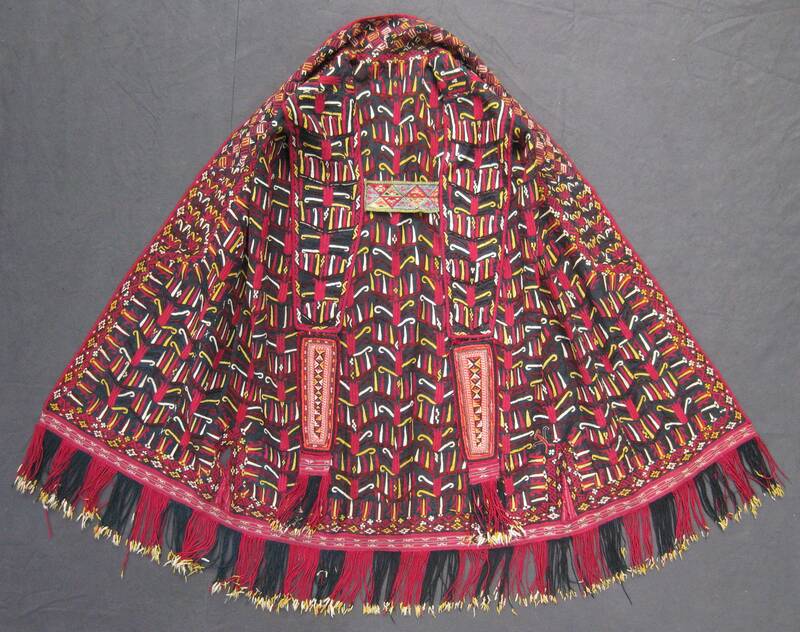 This richly embroidered mantle was made for a woman of the Tekke tribe in Turkmenistan during the last quarter of the 19th century. A Chyrpy was worn over the head and hung loosely over the body. The sleeves were non-functional; in the case of our Chyrpy they are two rudimentary vestiges of sleeves hanging down the back as two embroidered bands held together by a horizontal band of material embroidered in a different pattern and colour scheme. A Chyrpy denoted the status of its wearer, in particular age: young, unmarried women wore a Chyrpy with a background of almost black dark green, a yellow ground colour signalled the status of a married woman, white was reserved for older women. It would appear that the black/green ground mantles were the most elaborately embroidered and the white mantles the least embroidered garments. The very fine silk embroidery in dark red, yellow and white on black/green silk in our Chyrpy depicts a fairly abstract tree of life design with tulips as the identifiable flowers and a more geometrical motif down the front. It is lined with original block printed cotton and partially hemmed in with striped cotton in the same colour scheme as the mantle, finished off by original silk braiding in dark red. Since it took an enormous amount of time to complete such a fine and elaborate embroidery, these garments were usually preserved within the family. For further reading see Johannes Kalter, The Arts and Crafts of Turkestan. London, Thames and Hudson Ltd, 1984 (translated from the German Aus Steppe und Oase. Bilder turkestanischer Kulturen. 1983), in particular the section on costume, pp. 81 -110.